Thanks To You Blog Reader! Yes…you. I love Thanksgiving. It’s my favorite holiday. It seems like the whole world starts trying to celebrate Christmas after Labor Day. But I like the idea of gathering with family and friends, with no gifts, and being grateful. And this week I have talked a bit about being grateful and kind in our lives here. But today I wanted to say “thank you” to you. Yes…you. Since May 31st I have been writing a blog post here every day. It’s been fun on some days and a struggle on others. But I have put something up here each day. And today, it occurs to me, that many of you have read quite a few of them. That means a lot to me. So I am grateful for you. In honor of that, and in honor of those that have joined in along the way, I have decided to share some of the most read blogs here. 5 Books I Recommend: There are some cool books on this list, and it ties to my podcast. But this one took off because my good buddy, Jeff Haden, shared it! He is a Linkedin influencer (and this features one of his books). I Am Not For Everyone: This is one that caught we off guard. I took this from a conversation I was having and post it at the last minute. But it must have struck a nerve! Sometimes authenticity and vulnerability matter. 3 Lessons from Bohemian Rhapsody: My wife and I enjoyed this movie (regardless of reviews) and it made me think. I woke up the next morning thinking about the band’s journey. Here is what I took from it. 5 Lessons from Skucamp: It’s funny. This event has obviously left an impression with me. I posted about it yesterday here. But my original post about my lessons from the overall event still have people checking it out. 5 Book I Want My Daughters to Read: Yes, I am all about books. But this book list is foundational for personal development (from my perspective). Check out the list here…and read them! 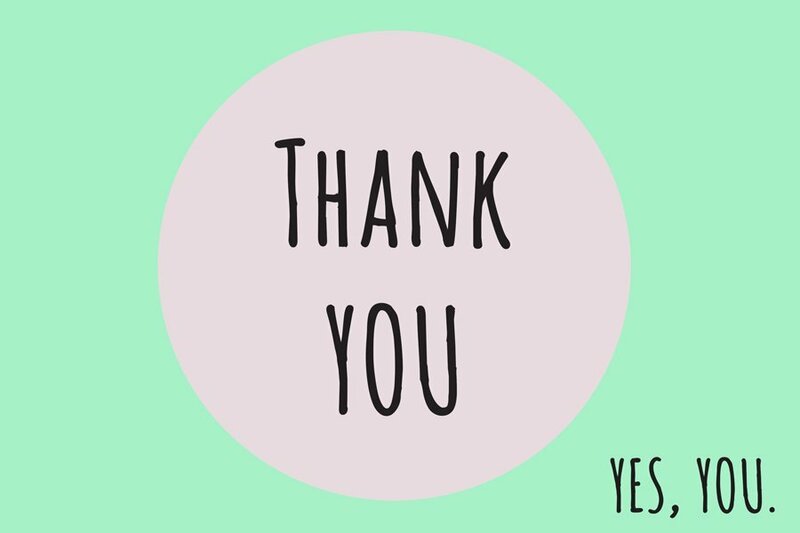 So like I said, today I want to say “thank you.” I really appreciate you taking the time to read, engage, share and grow! Let me know if I can help you! Make sure you never miss an update! Sign up for our VIP newsletter here! Each week we put together one email with all of the content of the week and send it to you! I preach the power of consistency. A lot. I talk about it content marketing, sales, building a business, fitness…and life. We need consistency and patience. Intuitively we all know it’s true. Sure…some people might take off like a phoenix to success. But most people have to “show up” over and over and over before an audience starts to notice. It makes sense and I know it’s true. But knowing it doesn’t mean it’s easy. Let me give you an example. I decided about a month ago that I needed to double down on my content marketing efforts for Hasseman Marketing. I even blogged about it (here) at the beginning of the journey. “We are a media company, and we are going to start acting like it.” I also decided that I wanted to be unreasonable and I talked about that here. So I did. 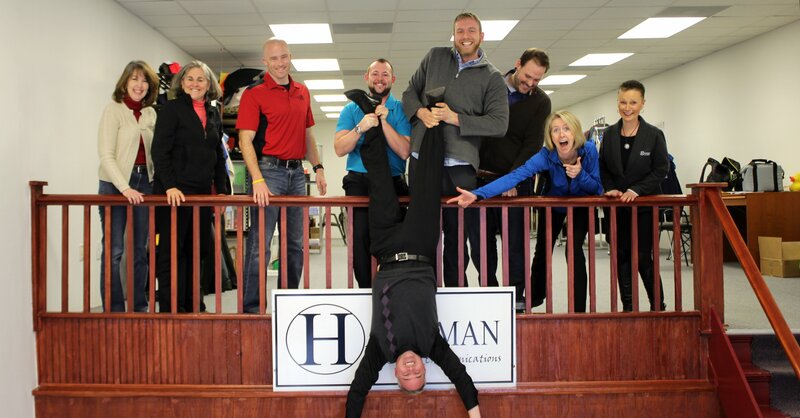 I started to post a blog on the Hasseman Marketing website every day. One of my goals, as you might expect, was to increase traffic to our site. I looked at our web traffic for the year and took a snapshot to see what that looked like before the journey. We had had one month in the past year where we had the most traffic by far (it was because of one post) and the previous month (May) was our lowest traffic month of the year. I knew that if I posted every day, we could have a significant impact on our website traffic. I just knew it. Right? About 10 or 12 days into the month I decided to take my first look. I was on vacation and I had time. So I decided to check on the progress so I could brag about the difference I was making in our online presence. What did it look like? Well by posting each day, our traffic (at that point in the month) was lower than May. That’s right. The traffic was lower than our worst month for the previous year. I know…it was only 10 or 12 days in…but I would be lying if I said that didn’t hurt. At that point it would have been easy to say “screw it.” It’s not working. But instead I decided I wanted to see the experiment through. Spoiler alert…I was glad I did. By continuing to post each and every day, something cool happened. Though I did not have any “hits,” the cumulative effect of showing up, started to work. Each day the numbers started to climb. People on Linked in might comment on a post that I had put online a week ago. And with each passing day, there are more posts for them to find. Over the next few days the numbers went past our worst month and worked their way up the list. We continued to track up…slowly but surely. By the end of the month, the best month’s traffic was in range. Did we pass it? Yes. And we did it with no “viral hit.” It’s hard to see the progress and the impact of a goal while you are grinding toward it. That’s the reason to focus on the daily list of tasks. We all want a quick hit to the top. 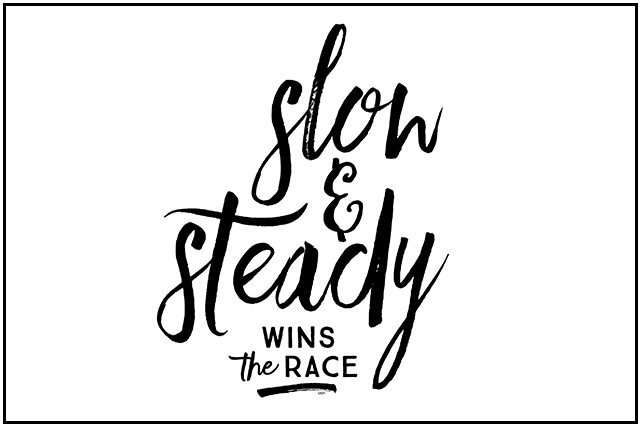 But in the end, it’s slow and steady that still wins the race. Make sure never miss an update (or any piece of content!). Sign up for our VIP newsletter here. NBA All-Star Game…and Sales Anything Is Possible! All About the Benjamins Remember, this blog is every day…so mark it has a favorite and check back each day! Weekly Word: Each week we create a short video on personal development, sales and growth. This week we remind you that you should IGNORE that voice in your head that tells you you can’t. Watch here. DMJ Podcast: As you know by now, Kirby is creating a Delivering Marketing Joy (DMJ) Podcast each business day. Here is the list of topics from this week…you can listen in here or subscribe and listen anytime! They are available on iTunes too! You Are Media Company...you need to start acting like it. Try New Things…every once in a while we need to stretch ourselves to get to the next level. DMJ Interview with Danette Gossett…listen in on a great interview with an expert at branding and blogging! Put Good In...if you want to start your day off right, start by putting good in your brain first. Appreciation...today we discuss a statistic that should scare you…and how to fix it! So as you can see, there is plenty to learn and grow from here! Please take a few minutes and dig in. Let us know what you think! Want to keep up all the time? Make sure to join our VIP List! Our VIP’s get an email with the latest content…and other special offers as well. Join here. Here’s hoping that each of you had a GREAT Thanksgiving holiday! The holiday season is certainly now upon us, so we hope you enjoy it! Now for a quick list of content the team at Hasseman Marketing created this past week. We hope you get a lot out of that too! 3 Mistakes with Print Design: One of the best ways to catch your customer’s attention is through great design. But not everyone can afford to pay a professional. So here Josh Williams gives you some things to watch for when doing your own design. Click here to read more. Weekly Word: It was Thanksgiving week, so the Weekly Word reflected that. But have you taken the time to say “thank you” for your customers, employees and stakeholders? Now might be a great time. Here is your reminder. 50 Books: Kirby set the goal at the beginning of the year to read 50 personal development and business books. He is at 47! Here is his list. Some great books on this list. Let us know if you want input on any of them. 11 Tips To Lift Your Spirits: This can be a tough time of year for some people. So here are 11 Tips to get you on track for the holiday season. The Right Reason: Trying to mask the “real reason” you are doing something can slow down your progress. If you want to make real progress, stop looking for the “right reason.” Read more here. Delivering Marketing Joy: The Delivering Marketing Joy webshow has been rolling along each week for more than a year now! Hard to believe! This week we take a look back at some of the best questions Kirby has been asked…and how he tackled them! Watch this episode here! Creating Your Christmas List: Most of us has been asked to do this. Create your own Christmas list. Write down all of the gifts you might want so that your relatives can go and get them for you. But do you take that much time to write down the things you want to provide yourself? Maybe you should. Read more here. A Second Coat: We end this week of Content with a quick post about not giving up on the first try. The fact is, sometimes we just need a 2nd coat. Read more to find out what this is all about! Considering it was a short week, we got a lot done! We hope that you get something out of each post. Please let us know! And that is how we do it. Want to keep up all the time? Make sure to join our VIP List! Our VIP’s get an email with the latest content…and other special offers as well. Join here.